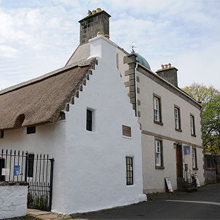 In this thatched cottage built c1698 by his great-grandfather was born Hugh Miller, on 10 October, 1802. Miller rose to international acclaim as a geologist, editor and writer. The furnished cottage contains an exhibition and video on his life and work. To the rear is a Scottish wild garden of colourful native plants, redesigned to reflect Millers own love of nature.